﻿No ifs and buts! Ray Charles belongs in every jazz collection. Friends of pure jazz tend to forget this in the light of his numerous hits in categories such as gentle ballads, and even country and western songs, and rhythm’n’blues during the more than 60 years of Charles’ extremely successful (also financially speaking) career. The producer Neshui Ertegun gathered together a star-studded cast for this Atlantic Records studio recording. There was David Newman on the tenor sax, Joe Harris on the drums, and even Oscar Pettiford on the bass. 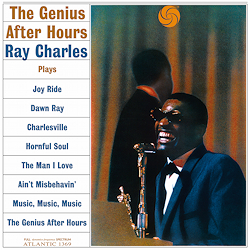 Not forgetting Ray Charles himself who was an excellent jazz pianist. Even a standard work such as Gershwin’s "The Man I Love" was turned into an elegy. Only "Ain’t Misbehavin’", which reminds one more of Earl Hines than Fats Waller, and "Charlesville" - a fast blues number - were treated to a change of tempo. "The Genius After Hours" is a self-portrait that exhibits the less well-known talents of this exceptional artist during the second half of the last century. It makes great listening for all lovers of jazz, soul, blues, rhythm’n’blues, country and western, pop, funk … You name it, Charles has got it!